↑ CIA gov. "CIA." HK GDP 2004. Retrieved on 6 March 2007. ↑ Grolier Incorporated (১৯৯৯)। The encyclopedia Americana, Volume 14। Grolier Incorporated। পৃষ্ঠা 474। আইএসবিএন 0-7172-0131-7। In Hong Kong, the Tanka and Hoklo peoples have dwelt in houseboats since prehistoric times. These houseboaters seldom marry shore dwellers. 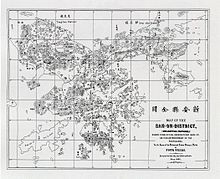 The Hong Kong government estimated that in December 1962 there were 46459 people living on houseboats there, although a typhoon had wrecked hundreds of boats a few months earlier. ↑ Info Gov HK. "Hong Kong Gov Info ওয়েব্যাক মেশিনে আর্কাইভকৃত ১৮ এপ্রিল ২০০৭ তারিখে." History of Hong Kong. Retrieved on 16 February 2007. ↑ International Substance Abuse library "http://www.drugtext.org/library/books/opiumpeople/opiuminthefens.html" Retrieved on 26 March 2011.